The Jonggöntje House was first mentioned in the island chronicles in 1785, as the residence of seafaring families. It was completely restored in 2012, although all the Frisian charm of this thatched gem has been preserved. Since then this family-run holiday property has been divided into two luxuriously appointed houses and a holiday apartment. The interior and exterior design features many touches that reflect the property's maritime history. Shades of blue and white as well as warm earth colours and high-quality materials create a stylish atmosphere. The garden with patio and the property's own sauna are perfect places to relax after eventful days. And if you are planning a holiday with a larger group (up to 12 guests), the normally separate halves of the house can also be combined to create a single unit. Cosy breakfast in a nautical setting. Unwind among high-quality materials and country-style furniture. Homely, quiet and comfortable - the sleeping area for pleasant dreams. Warm colours and beautiful details are features of this period-style bathroom. The „Kapitän´s” House, which sleeps up to five, has an area of more than 100 m2 on two levels and offers plenty of space and privacy. The bespoke kitchen units and built-in wardrobes were hand-made by local craftsmen. The house faces south and has a well-equipped kitchen, two bathrooms, a sauna, an original Frisian tiled stove and a patio with garden furniture. There is one room with a double bed, and three single beds are shared between two further bedrooms, making sure you can enjoy a wonderful night's sleep. The charge for the final cleaning service is € 150. There is a charge of 10 euros per dog per night in any of our properties. Please let us know in advance if you are bringing a dog with you, as dogs are only allowed in some of the homes and apartments. If you need a property that sleeps more than five, you can book the „Kapitän´s” House together with our „Offizier´s“ Apartment for two further guests, e.g. for grandparents, friends or the au pair. These apartments have separate entrances and are self-contained units. The „Reeder´s“ House featuring an elegant, Scandinavian style and is ideal for a family with children. The beds - one double and three singles - are spread across two rooms. This half of the house consists of two levels and has a well-equipped kitchen, a bathroom with its own sauna, a guest WC and a patio with garden furniture. The bespoke kitchen units and built-in wardrobes were hand-made by local craftsmen. Meals can be taken at the large dining table or on the sun-dappled patio. 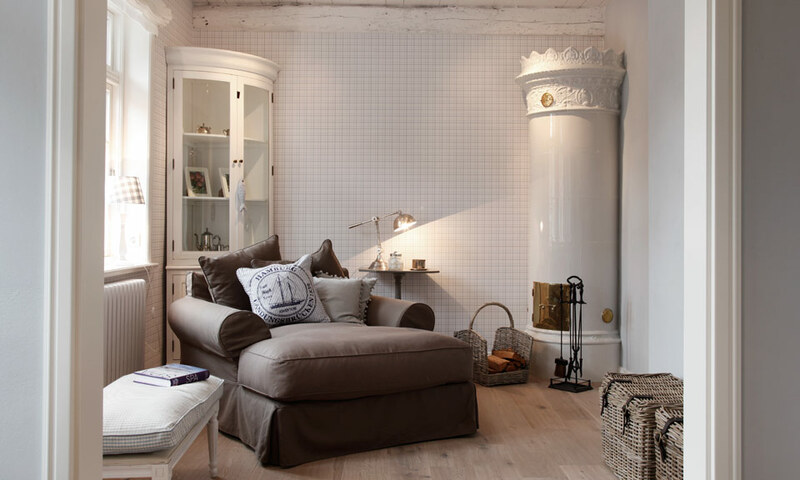 The original tiled stove makes the living area a wonderfully snug place to spend time in the evenings. The charge for the final cleaning service is € 165. If you need a property that sleeps more than five, you can book the „Reeder´s“ House along with our „Offizier´s“ Apartment for two further guests, e.g. for grandparents, friends or the au pair. Both parts of the house have separate entrances and can be extended via a connecting door to create a floor space of 142 square-metres. During off-season and mid-season periods you can book our luxury holiday apartments at reduced rates from just two nights’ minimum stay. The 32 m2 Scandinavian-style „Offizier´s“ Apartment is equipped with a double bed, a kitchenette and a shower room. It makes an ideal island hideaway for two or as an extension to one of the two larger halves of the Jonggöntje House. The dining and living areas of this elegant holiday apartment are separate. It also has a separate entrance as well as a patio with garden furniture. 1. Price when booked separately / 2. Price when booked with Reeder or „Kapitän´s” House. The charge for the final cleaning service is € 50. There is a charge of 10 euros per dog per night in any of our properties. Please let us know in advance if you are bringing a dog with you, as dogs are only allowed in some of the apartments. 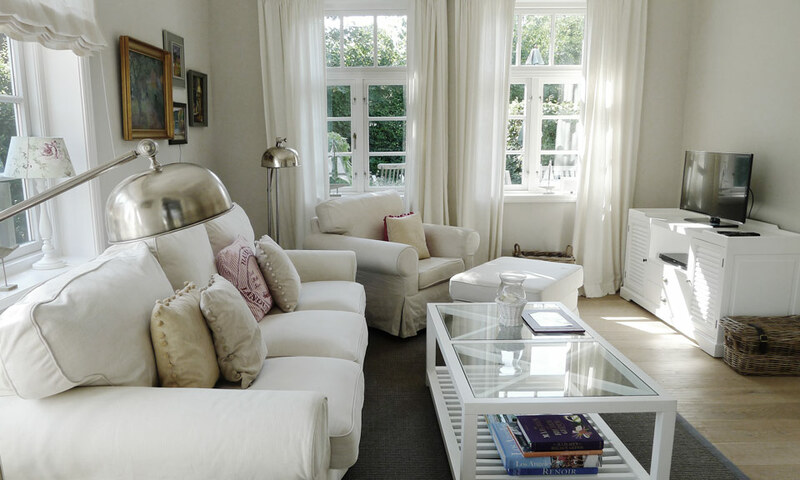 The „Offizier´s“ Apartment can be booked together with the Reeder or „Kapitän´s” House. Connecting door to „Reeder´s“ House on ground floor. Can also be booked as a separate unit in off-season and mid-season. The Jonggöntje House was once the home of notable seafaring families. Today this luxury holiday house offers a unique holiday experience. Inspired by their worldwide travels, the owners have furnished the completely refurbished thatched house with hand-picked, stylish items of furniture and accessories. Sophisticated materials and a distinctive lighting and colour concept are characteristic features of this exclusive retreat in the quaint old sea captain's village of Nieblum. 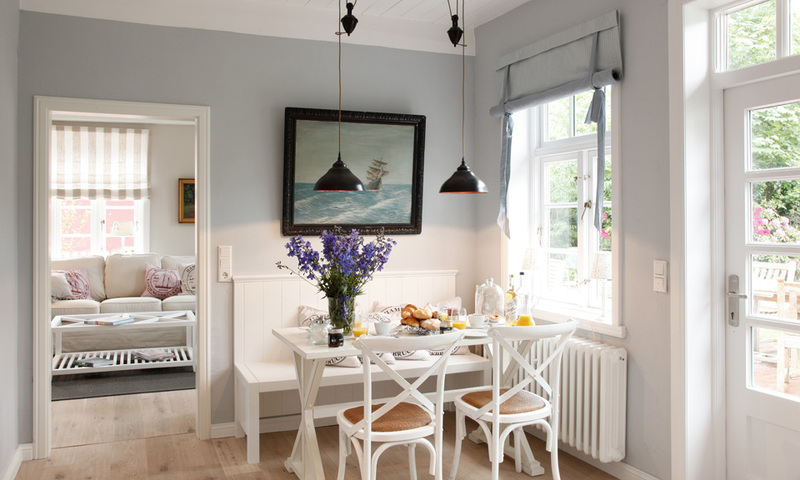 The Scandinavian design is a perfect match for the traditional, nautical feel of the property. The sun-dappled shared garden is an oasis of peace and has plenty of wooden seats or recliners to relax in. The Jonggöntje House is on Kapitän-Paulsen-Weg - named after the captain who was in charge on the first crossing of a German steamship from Hamburg to New York. It is in the heart of Old Nieblum. In summer this village is transformed into a lively holiday-makers' paradise. Restaurants, cafés and shops are in the immediate vicinity and the wide, extensive sandy beach is just a few minutes away. The historic Kommandeur House, with grounds that cover an area of more than 1000 m2, offers even more space for an exclusive holiday experience. The thatched, family-owned, detached house is also in the centre of Nieblum. Its nautical ambience is accentuated by sophisticated materials and numerous works of art - a stylish holiday home with space for five guests who will appreciate a carefree holiday in secluded surroundings.